There are a number of other protective components you may find near a multimeter’s input jacks. Some are connected in parallel with the input source, and are meant to trigger when the voltage across the input reaches a dangerous level, becoming a low-impedance path to essentially short-circuit the energy away from the rest of the meter’s sensitive circuitry. These components are usually spark gaps and/or varistors (MOVs). Others are connected in series, and will become an open circuit or high impedance when something goes awry and too much energy is being absorbed. These components are usually PTC thermistors and/or fusible resistors. The latter component masquerades as a regular high-wattage power resistor, and is sometimes also described as “flame-proof”. Thermistors should return to their normal impedance after the overload is removed and they have cooled down, but once a fusible resistor has “blown”, it no longer functions. Many (but not all) models of Fluke multimeters include a fusible resistor in series with the Volt/Ohm input jack. The meter shown in this repair is a first-generation Fluke 87. The metal-film fusible resistor is designated R1 (part #832550) in the model 87 parts list. Disclaimer: The following describes an amateur repair on a component that is critical to the safety specifications of the device. In cases where safety ratings are mandated, it is advised that repairs be performed by authorized service centers with manufacturer-approved parts. A meter with an open fusible resistor may power up and look normal, but upon trying to make measurements, it can act rather goofy. 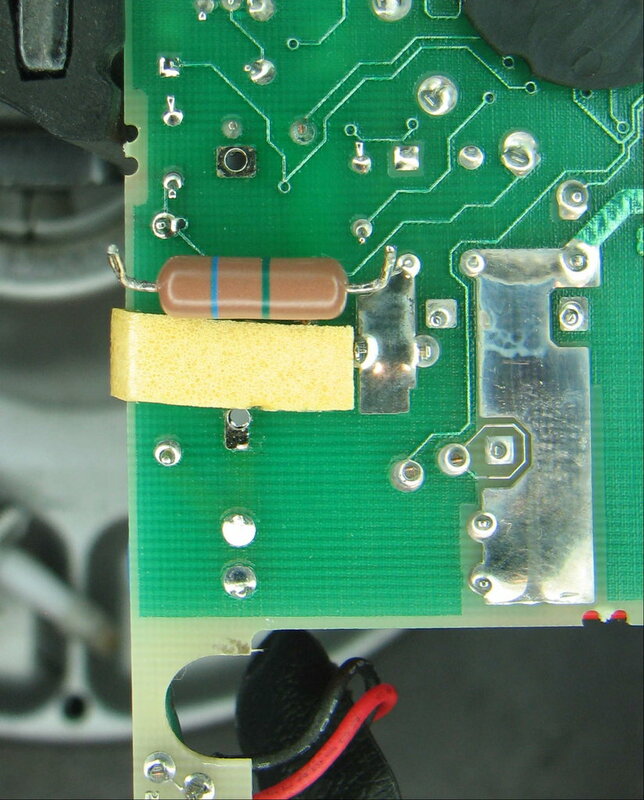 Let’s look first at the symptoms of an open fusible resistor, and then find and replace it. DC voltage is selected on the function switch, but when a DC voltage is applied the meter always reads zero. Resistance is selected and the leads are left open. A functional meter would display a steady OL, but this one displays positive and negative random numbers and sometimes flashes OL. If the beeper is turned on, it will beep randomly. On the diode check range, with no leads connected, the meter would normally read OL. Instead this one seems to be stuck at 0.000V. Attempting to measure 120VAC mains results in a very small unsteady voltage being displayed. The broken resistor is capacitively coupling a small voltage into the front end. Begin repairs by disassembling the meter. For this particular repair, you may get by without removing the shields as shown. But I like to set aside the plastic parts while waving a soldering iron around. If you take off the shields, pay particular attention so as not to break the fragile bits, marked on the photo at left. Breaking one’s fragile bits leads to a bad day. Do not confuse the fusible resistor with the Ohms sense resistor, which will almost always be very close by, since it also connects directly to the red input jack. This one is light blue and is 909K ohms. The ohms sense resistor in most Fluke models is usually at or near 1 Meg. Using another multimeter, we can confirm that this fusible resistor has failed open. A good resistor would read about 1K ohms, this one shows open. De-solder the old resistor and clear the holes of solder. A solder-sucker and/or solder wick is handy for this. Solder the new resistor in place. Be sure to clean any flux residue left on the board with IPA. Residues and contamination on the PCB are not a good thing in the front end of a digital multimeter. Reassemble and test the repair. 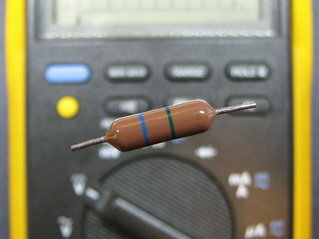 Here, an 806-ohm precision resistor mounted on a dual banana plug gives me a quick means to check resistance accuracy. Looks promising. Checking VDC calibration with a 5.000VDC reference. One count off. Not a problem. Measuring 120VAC mains now gives a good reading. Goofy meter is now acting sane again! Update: After I prepared this article I discovered that DigiKey (and Mouser, Newark, etc.) no longer stocks the replacement resistor I used. The following are possible sources of replacement parts. Note that non-Fluke replacements are not guaranteed to return the device to its original safety specifications. 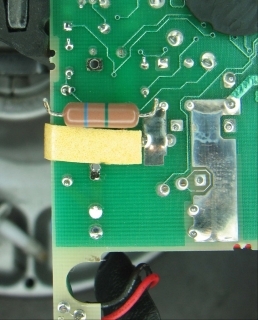 This entry was posted in How-To, Repair and tagged 80-series, DMM, Fluke, Safety. Bookmark the permalink. Dear Mr. ModemHead first of all respect of your skills to repait dmm model and your blogger site. I found your blogger site after i looked for adding a summer to my low cost dmm (Digital Multimeter DM 830 E) when I testing a wire to hear a sound and not looking on my dmm all the time. Please can you help me to add a summer for DM 830 E and explain how it works? I assume you refer to a ‘beeper’ or ‘buzzer’ for continuity testing. You will need to add a piezo element, a comparator, an oscillator, and a gate of some sort to allow the comparator to turn the piezo element on and off. When a low resistance is placed across the inputs, the voltage across it drops close to zero. 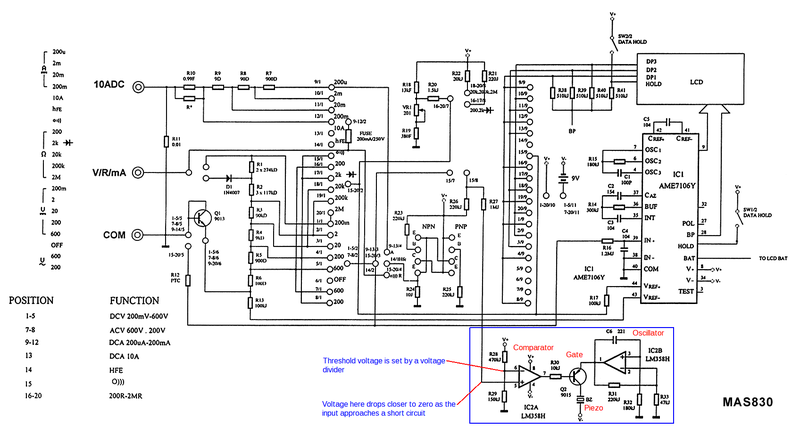 The comparator detects when this voltage goes below a set threshold, and turns the beeper on. Here is a schematic for a simple 830-style DMM with continuity feature. I added notes to point out the how the continuity works. Hi yes your ´re right! thank you for the fast answer!!!!! ok I will try !!! Keep doing your blogger site !!! To repair dmm is good to ask peaople like you, you are very special. I too have two of the cheap 830 digitals that “supporter” is in the process of modifying, and yes they are cheap but for a simple icl7106 clone blob chip they work quite well really. The dc voltage and resistance is accurate enough for ordinary go/no go testing. I must get a fluke portable multimeter before you kidnapp all the available ones floating around :-), the trouble is the plethora of models confuses my small and often confused brain. Dear harvey, you are a plonker, you have given the impression that the two 830 multimeters you have are being modified by “supporter”. You are english and your spelling&punctuation is rubbish. Glad you enjoy my write-ups. Come back anytime. I have a few more in the queue at the moment. Being confised doesn’t hurt, does it? The ICL7106 is a wonderful invention. Makes it simple as pie to make a very accurate DC voltage measurement. And it’s what, a 30+ year old design? That’s why the 830 cheapies are even useful at all. Safety and reliability is of course, something else entirely, and not to be found in those ubiquitous little boxes. You’re right, Fluke model numbers can be confusing. That’s what happens when the marketing department gets involved I guess. Yep your right (no supprise :-> ), 806 ohms at +/- 2.015 ohms, and i bet its even better than that, manufacturers tend to show the worst values on some things. The last ones I got were from Moyer Electronics. The folks there were very friendly and helpful even though my order was small. The part is not an exact match, but it’s pretty close. Sorry I failed to take into account your location. Glad you found an alternate source. Thanks for this writeup I would not have known what that part was! I have a Fluke 27/FM that needs a similar fusible resistor in series with its input. Moyer does have the NTE part you mention, but they want $10 to UPS this $1 part. How about putting four 4.7K 1/2 watt fusible resistors in parallel for this purpose? They’re 54cents and are carried at my usual supplier (DigiKey). I think I can fit them in there. Thanks for all these helpful informations! I have a Fluke 27/FM that needs a the fusible resistor and the one beside it (220k) which is also open. I did not know that component was a fusible resistor until I read your article indicated by one guy (Marvin) from Estonia (http://www.eevblog.com/forum/testgear/fluke-27-27fm-side-by-side-tear-down/msg386093/#msg386093). Please, the rt1 (.022k 1000) in series with the fusible resistor is also open. Can I replace it with a fixed 20 Ohms resistor? RT1 is a 1K-ohm @25C PTC (positive temperature coefficient) thermistor rated 1000V, 40% tolerance. It acts like a self-resetting fuse. Replacing it with a 1K fixed resistor will allow the meter to function, but will greatly compromise its input protection scheme. 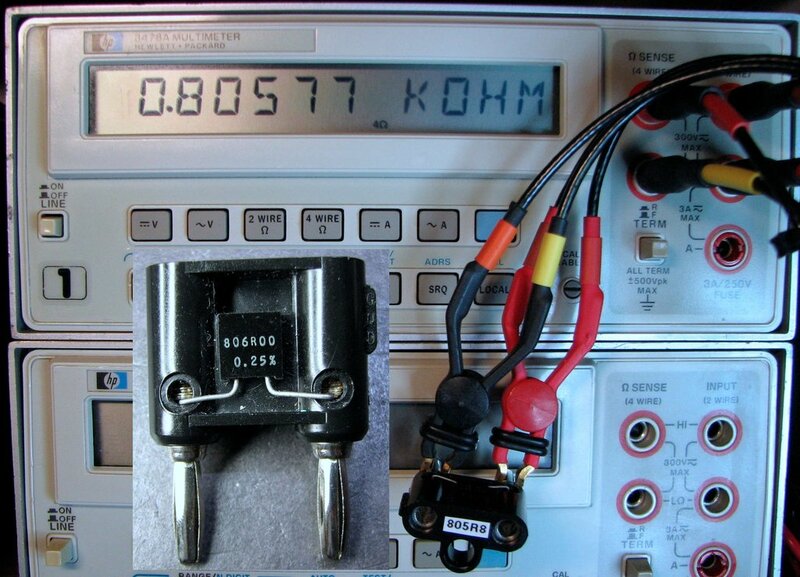 Thank you so much for your prompt response and nice explanation.I wrongly thought the .022k stamped on the component meant its ohmic value.Before doing the “adaptations” I’ll try to get the right parts thru a friend that works with electronic instruments. He may have some used spares. In case you know how to get the Fluke 27FM Service Manual over the internet, please be so kind to informe me. I think the “/FM” model was only for the military, so there may not be a service manual circulating for it. My PDF copy looks like it’s for the more recent yellow 27 models. I do have a hardcopy military-style “Operator’s Manual” for the 27/FM, but it has no service information. I’m reasonably sure the 8025B will be very close to the 27/FM, except for the RMS converter section. The manual for that is available. I now understand why “RT1” and the “.022K” didn’t make sense. C3 is a 0.022uF capacitor, the K is the tolerance (10%), and it is rated for 1000V. 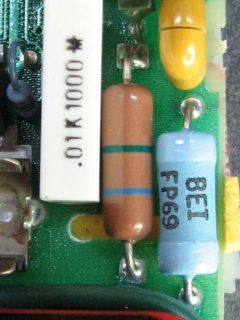 It is the coupling (DC-blocking) capacitor for the AC functions. The thermistor on this older model is the gray rectangular component just north of the 5 green blobs which are varistors. You are correct, the “/FM” model was for the military. According to the seller, this one came from the military when they sold a bundle, some in bad, others in pretty good condition. I will call a friend of mine that works at a Air Force PMEL first thing on monday to see if he can get me some scraps and a copy of the service manual that can send to you in case you’re interested in. By the way, I took a PMEL course in 1984 at Lowry AFB and worked with calibration til 1998. I worked most of the time repairing Tek Scopes, specialy 465 M, signal generators and Spectrum Analyzers before changing to another area. So, I’m having a lot of good memories reading your posts. Thanks again for all your valuable informations. I have a Fluke 75-2 with a blown R20 Fusistor. Fluke part 740662. This Fusistor (0.36Ohm, 2W, +-10%) seems to be a safety circuit for the >300mA input jack, together with a glass fuse (630mA, 250V). Since the original part is no longer available, nor being manufactured I am looking for a replacement. I am not an expert regarding circuits etc…. If I am thinking right, the glass fuse is protecting the multimeter’s <300mA input of amperages over 630mA. The fusistor that is directly behind the input jack in the circuitry should be protecting the multimeter of higher voltages than 0.85V… correct!? So any replacement fusistor, protecting the multimeter's <300mA input of higher voltages than 0.85V should work fine in this safety circuit, right? E.g. a fusistor with specifications like 0.33Ohm, 1,5W, +-10% would only tolerate a voltage of 0.7V, right? Thanks for helping me out and given short advise on that matter. Would be a shame to dispose a fine working multimeter only because of a broken fusistor…. My opinion is that the function of R20 is to interrupt the circuit in a massive over-current situation. The small 630mA fuse has a low “interrupting rating”, meaning that a sufficient amount of overload current could simply arc over the fuse element even after it breaks. R20 should then provide a secondary method of interrupting a severe overload. It will dissipate 2 watts at 2.36A, so at some point beyond that it should open up. The voltage drop across R20 is not particularly important, except that it will contribute negatively to the “burden voltage” of the DMM for the 300mA range, so the lower the better. Your suggested replacement seems reasonable to me. Be aware that all non-Fluke 832550 resistors carry a much lower voltage rating than the voltmeter – some as low as 200V ! The original (Fluke 70-series era 1K fusibles, PN 650085) were available commercially, but no longer. Fluke went to the 832550 to ensure the CAT rating on the meters is maintained – very important in this litigious society. One shock/incident with a modified meter is all it takes. Spring for the Fluke resistor (~$9 from Fluke these days) and you’ll never go wrong. Your concerns are valid and the article has been updated. Thank You for this site. I was very upset when my 87 failed. It had been a great meter for many years. I thought I was going to have to replace it and did not like the idea of that. Moyer Electronics sent me the parts in 2 days. The repair was very easy and it is back working perfectly again. Hello all I’m new to the fluke bug and got bit. I received a fluke 87 very first ones. Any way I have a question or two that I hope you can answer. I hope the pics can be uploaded. There is 2 components one looks like a box with two legs on one side and one leg one the other side and it has the letters JCP. The other is a box with the numbers 511 on top. Do you know what types of resistance used in the Fluke 87 III ?